HELLO! You've heard the good news right! 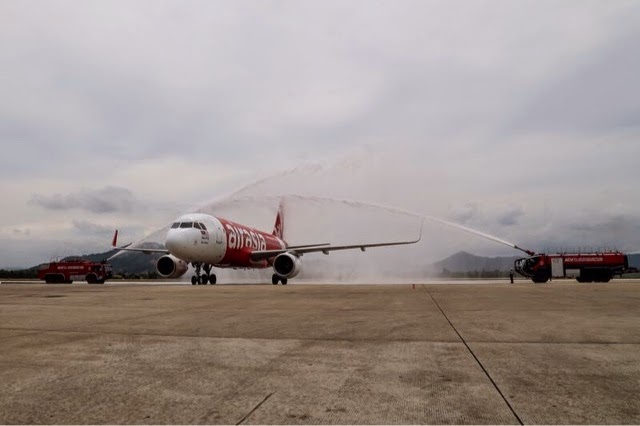 AirAsia has added Da Nang, Vietnam back into its list of extensive route network and also marked this occasion with a receiving ceremony for the inaugural flight which landed Da Nang last Friday at 1330hrs local time. Yours truly joined the rest of the 179 guests were on board the inaugural flight (AK648) which took off from Kuala Lumpur on time at 1135hrs (GMT +8) and the flight was given a grand welcome with a water salute upon arrival. Mr Spencer Lee (AirAsia Berhad's Head of Commercial) was also on board the flight to celebrate this special occasion! Mr Tran Chi Cuong (Vice Director of Culture-Sport and Tourism Department of Da Nang), Mr Nguyen Ba Quan (Vice President of Da Nang International Aiport) and Mr Nguyen Thanh Vu (Vice President of Da Nang Terminal Operation) were there to receive the guests from the inaugural flight. AirAsia is the only airline to operate 4x weekly direct flight connecting Kuala Lumpur to Da Nang. Guess what? In conjunction with the celebration of the inaugural flight from Kuala Lumpur to Da Nang, AirAsia is offering promotional seats with all-in-fares from as low as RM97* one-way. Booking is available online at www.airasia.com or visit AirAsia's mobile site at mobile.airasia.com. ** Booking is also available on AirAsia's mobile apps through iPhone, Android devices, Blackberry10 platform and the Windows platform.